Any naive user who don’t know how to recover deleted email from Exchange Server, then below information can be useful for them. Nowadays Various Exchange Server Version used by the people such as Latest version 2013, 2010 and 2007 etc. According to the different condition, a user can use various method to recover deleted data items. “I am an employee of the company. One of the staff members is suspended due to some reasons. My director came to me and asked if it is possible to find and recover deleted emails from Exchange Server. I try looking and searching for it but, could not find much information regarding this subject. I am wondering if anyone here is kind enough to guide me. We have the Exchange server 2010 and we are connected by OWA or MS Outlook. Is there any manual method recover deleted emails from Exchange Server 2010? When a single item (Email file ) is hard deleted from any mailbox, the message gets stored in the recoverable items folder of the Exchange server mailbox. The deleted item is present in the Exchange mailbox till the Retention Period is over. This option is used to recover hard deleted as well as soft-deleted items from the Exchange Server mailbox. Single items can be recovered without restoring the complete database. 2. Enable the single item recovery and set the retention period of the deleted item for any single user. The following command activates the recovery of the single item and sets the retention period of 30 days. In this command, the retention period for multiple users has been set to 30 days. Using the above Powershell Commands, any naive, as well as the expert user, can recover single items. A user can also use the command to Restore Deleted Mailbox Items from Exchange 2016. Switch to the Limits tab, you will see the option of Keep deleted mailboxes for. In this block, you can keep the desired number of days. By the Default retention period for Deleted items for Exchange Server 2010, 2013 Server is 14 Days and recoverable items warning quota & recoverable items quota is 20 GB (gigabytes) and 30 GB respectively. For Single Delete items recovery procedure, the Exchange Admin center is not disabled or enabled. The Maximum retention period for Mailbox item is 30 days. 2. Open up the store where the mailboxes of users are present which are deleted. Right-click on the store where the mailboxes are stored and deleted mailbox is kept in. Now, you have to reconnect this deleted mailbox. To do this, you have to make a new user account in the active directory. While creating the new account in “Active directory users and computers”, make sure that you are not creating the mailbox for the new account. So, Uncheck the box for “Create an Exchange mailbox”. Open the Exchange System Manager, open the mailbox store where the deleted mailbox is stored. Select the mailbox container. Right-click on the mailbox which you want to restore and select reconnect from the available options. From the “Select a new user for this mailbox” dialog window, select the deleted mailbox account and at last click on OK.
At last, you will get a message stating the successful completion of the operation. Click OK. There are chances that a message may appear on the screen stating the object has been not yet replicated. Click on OK.
At last, you have to run “Mailbox cleanup Agent”. After it is executed properly, the mailbox will be connected successfully. Tip: By enabling “deleted item retention” and “deleted mailbox retention”, you can save yourself from restoring any item or mailbox from the backup. For Exchange Server 2013, a user can also go for Outlook Web Access to recover deleted email items Exchange 2013. For that Open OWA or Outlook Application select the Mailbox and Click- Right and select “Recover Deleted Items option” This helps the user to recover back the single items to appropriate folder. Users can also set the individual mailbox quota. This can be done if a user simply unchecks the option of Use Mailbox database defaults and enter the desired number of days. As we see various manual method are available to recover items, but an alternative solution is available to without using Powershell and Exchange Management Console. 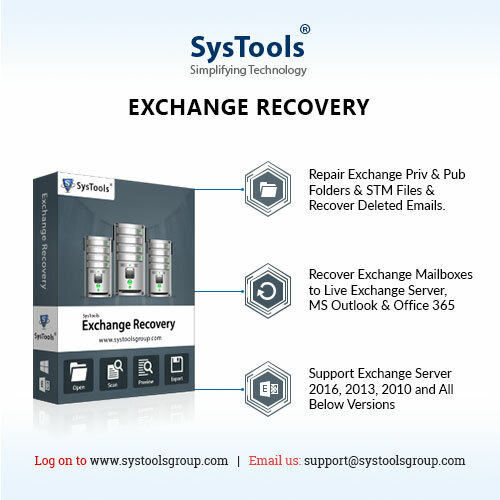 In the Exchange Server Mailbox Recovery process, a user can go for Exchange Recovery Tool, specially designed to recover Deleted Emails items In Exchange 2007, 2010, 2013, Server. It not only recovers Email but a user can also recover contacts, Calendar, Notes, Journal and Task Details. 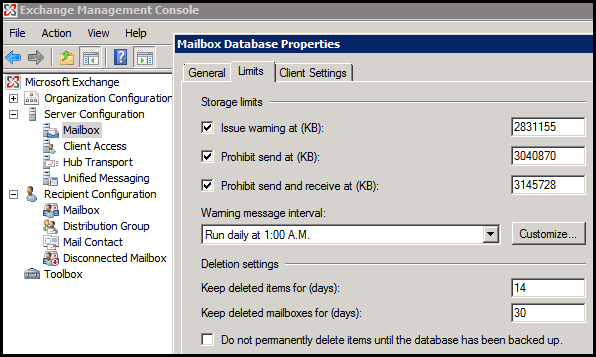 If the mailbox is deleted permanently or temporarily, it is present in the Exchange Server until the retention period. The number of days of retention period can be increased or decreased depending upon the users. Also, there are different approaches for retrieving a single item and a complete mailbox. Various methods have been discussed to recover deleted email items from Exchange Mailbox.